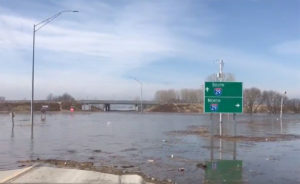 Flooded I-29 from the Governor’s twitter feed. “Catastrophic devastation” is how Iowa Governor Kim Reynolds describes the carnage from the second major flood along the Missouri River within a decade. Reynolds toured flood-impacted areas of southwest Iowa today, with stops in Council Bluffs, Glenwood, Pacific Junction and Hamburg. While in Hamburg, Mayor Cathy Crain told Reynolds citizens fought valiantly, but water seeped through barriers and swamped all but the northern portion of the community. Flooding not only knocked out the city’s water plant, but also Hamburg’s City Hall, fire station and almost all the businesses in the community. The mayor said virtually all the equipment the city owned is gone. Governor Reynolds met with officials from Hamburg and Fremont County inside an elementary school that’s now serving as a temporary city hall. Reynolds also got updates on other communities such as Percival, where floodwaters entered the community this afternoon. She also heard concerns about how this latest flooding incident will impact the local farming community. Fremont County Supervisor Dustin Sheldon said many residents were still recovering from the floods of 2011. Sheldon and other officials say it’s time for federal flood control policies to change. Others expressed anger that federal officials forced the city to remove fortifications to a levee which helped protect Hamburg during the 2011 flooding. The governor indicated she intends to review that levee issue. Reynolds said the state will come up with a plan to rebuild and recover. Interstate 29 has been closed in southwest Iowa due to flooding. 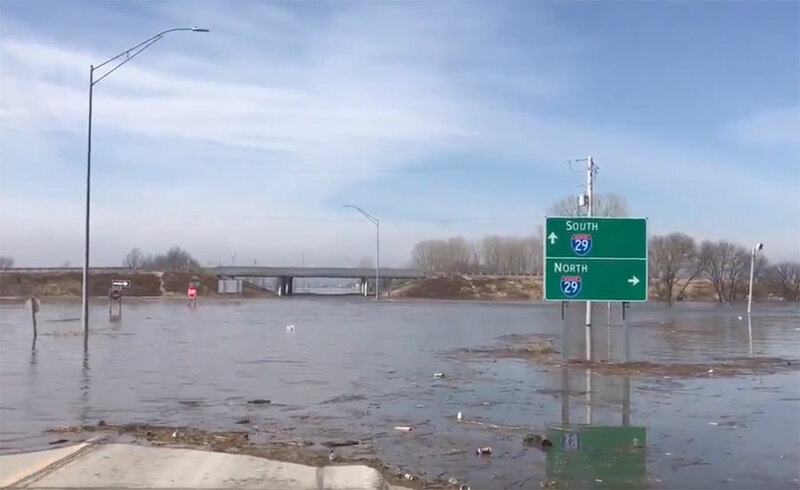 Rivers in other parts of the state are elevated and ice jams have been reported in places like the Cedar Rivers in Cedar Falls and the Iowa River in Iowa Falls. There were sandbagging efforts in Iowa Falls today to protect the city’s water supply.